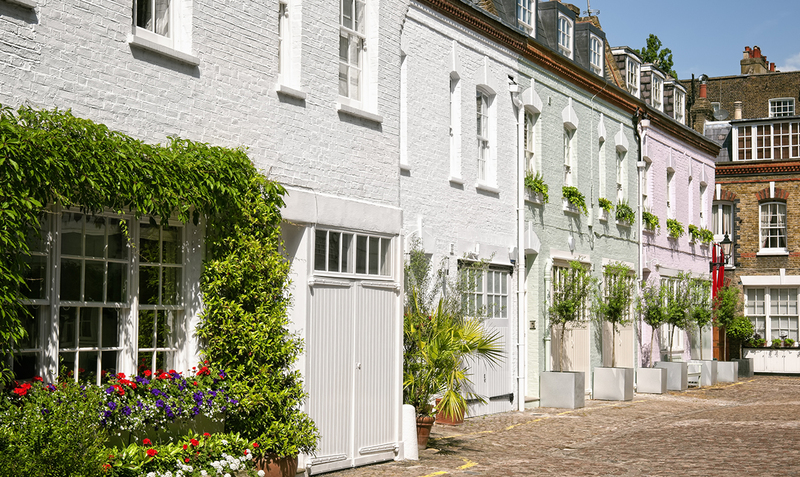 There’s more to Notting Hill than just the setting for a famous movie. Also known for hosting Europe’s biggest street festival, the Notting Hill Carnival, Notting Hill is teeming with fashionable restaurants, trendy bars and high-end shops, and is home to one of London’s best markets: Portobello Road Market. Portobello Market, which runs the two mile length of Portobello Road, is a rummager’s delight. You will find everything from fresh food and flowers to antiques and clothing. There’s so much to see, it can take a while to wander the two miles, especially if you take the time to marvel at the movie-set worthy streets and colourful houses. 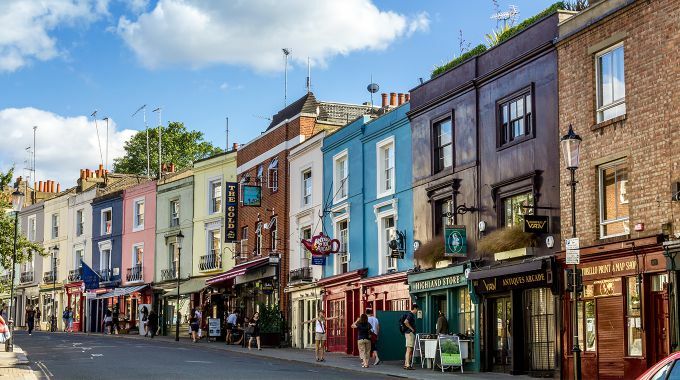 With its quaint cobblestoned streets, rustic Victorian townhouses and pretty gardens, this west London neighbourhood is an idyllic place to live and hang out in, whether you’re into shopping, eating, film, or just plain people watching. Despite its more shabby history, Notting Hill has transformed into one of the most desirable locations to live in London with a number of rich and famous residents. It’s a popular place for families and young, fashion-savvy professionals, who live in a mixture of large sub-divided terraces, charming mews homes and apartment blocks. The average monthly rent for a 1 bed flat in Notting Hill is £2,010 and for a 2 bed flat it is £2,444(Foxtons: September 2017). Notting Hill is within the Royal Borough of Kensington & Chelsea, bordered by the London Borough of Hammersmith & Fulham, as well as Bayswater, Westbourne Green, Holland Park, Shepherd’s Bush, Kensington and Hammersmith. Transport to and from Notting Hill is easy. The main tube station is Notting Hill Gate, but there’s also Holland Park, Ladbroke Grove, Bayswater and Queensway nearby (depending which part of Notting Hill you move to), making the Central, Circle and District Lines very accessible. You can also catch one of the many buses that frequent the area, or if you fancy walking, Kensington High Street and the beautiful Kensington Gardens and Hyde Park are just a short walk away. Portobello Road Market has been around since the 1800s. It has evolved throughout the years and is now well regarded as one of London’s best markets, with over 1000 dealers. You will find a bit of everything here; antiques and curiosities, a huge variety of clothing (including vintage clothing), food and much more. The main market days are Friday and Saturday but there is a smaller market open throughout the week. Catering for all of your eating and drinking needs, no matter what time of day. The Electric Diner serves French-American style comfort food and a fab range of drinks. You can start your day here with breakfast, stay for lunch, dinner and keep on partying into the wee-hours with drinks and maybe even some dancing if you’re lucky. Next door to the Electric Diner you’ll find the Electric Cinema, one of the first cinemas ever built in London. 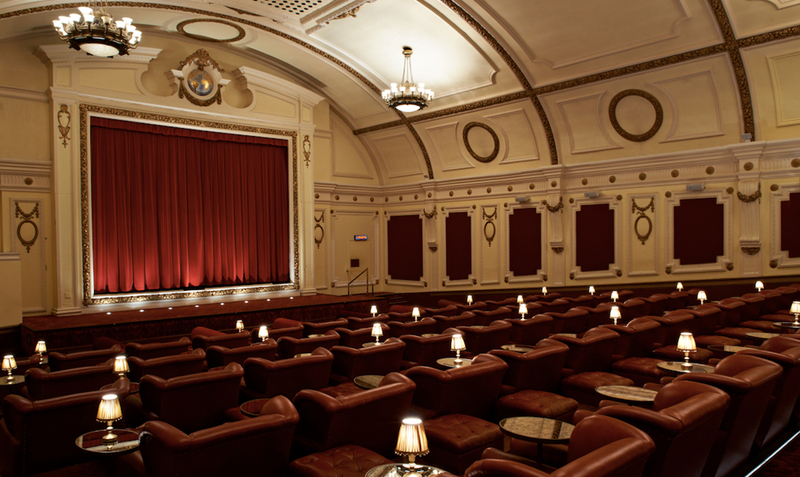 It’s now known as one of the more luxurious cinemas in London, with a choice of seating arrangements that range from large leather armchairs (with footstools and side tables), 2-seater sofas at the rear, or double beds in the front row complete with cashmere blankets – great for those who like to snuggle as they film-watch. They also serve a fine range of wine, beer and champagne and ‘substantial’ cinema snacks. Dreamy. One of the most memorable and unique pubs in London. 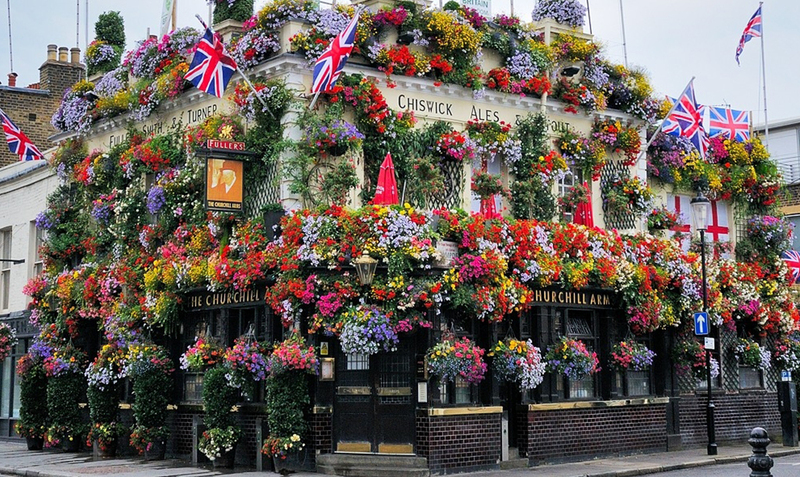 In the summer it blooms, as the 200 year old pub’s exterior walls are covered with so many hanging baskets of flowers that the brickwork is barely visible. This theme continues inside the pub where every spare inch of ceiling and wall space is covered with historic British-themed memorabilia, giving it a kooky but cosy feel. They know how to pull a good pint of ale, and they also have a great Thai restaurant at the back. A restaurant suitable for a very special occasion. 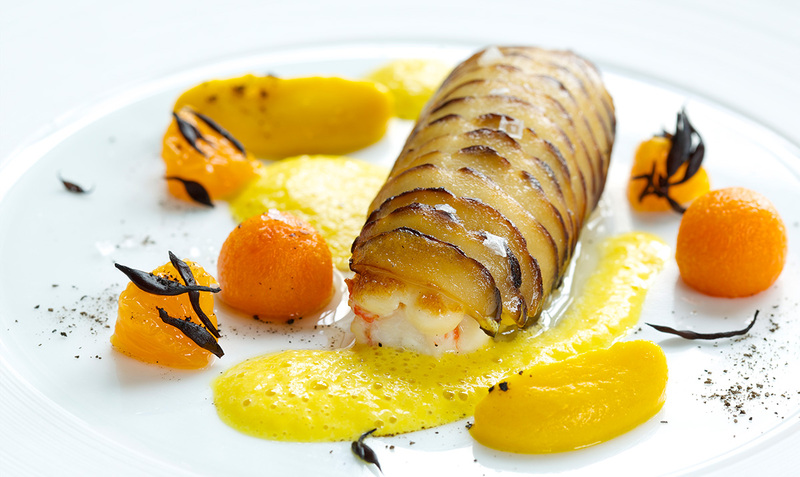 Boasting 2-Michelin stars, this innovative fine-dining establishment has received rave reviews, won numerous awards and is guaranteed to impress even the most refined of taste buds. Address: 127 Ledbury Road Notting Hill, London. Delicious and inventive food served in a playful, barnyard themed setting by cheery staff in chequered shirts. Everything you eat and drink in this restaurant is grown, prepared and served with love, with many ingredients sourced from in or around the family farm in Nutbourne, West Sussex. With very reasonable prices (for the quality and the area), it really is a must-visit. 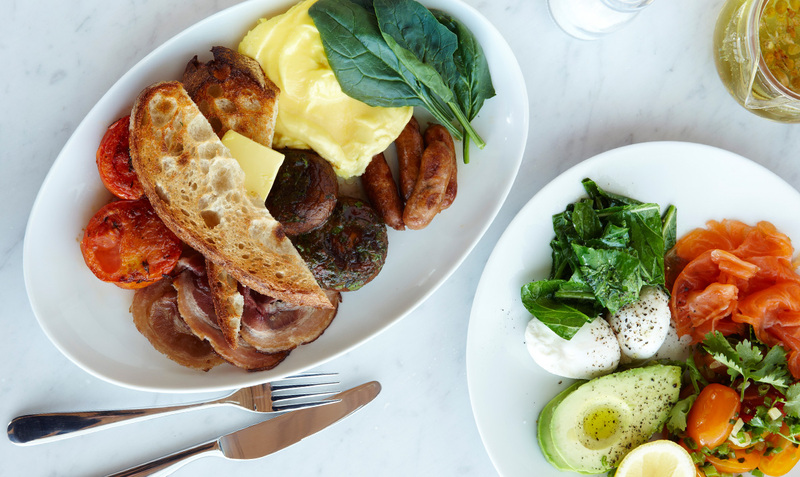 Immensely popular for brunch (you’ll often find queues out the door on weekends), Granger and Co is a great place to fine fresh, interesting and healthy food at all times of the day. Situated on Notting Hill’s beautiful Westbourne Grove, it’s a great stop-off option for a power lunch if you’re hitting the shops. The Notting Hill Carnival is one of London’s most popular annual events and is officially the largest street festival in Europe. It originated in 1964 as a way for Afro-Caribbean communities to celebrate their own cultures and traditions in London. 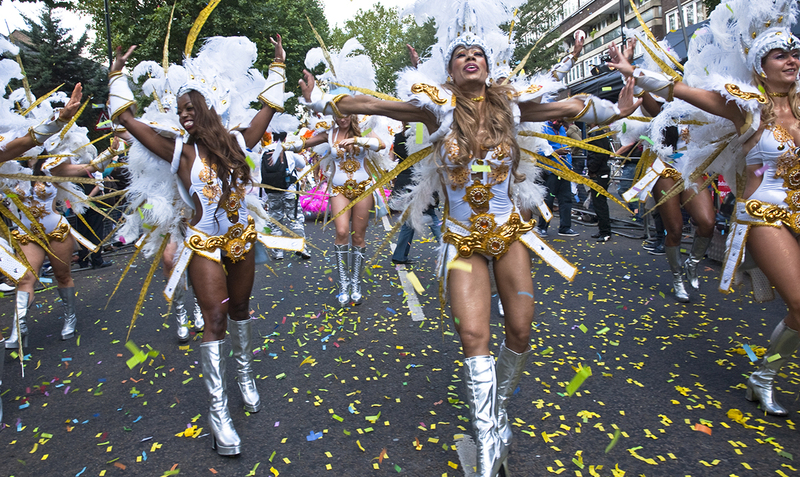 Taking place every August Bank Holiday weekend in the streets of London W11, the Notting Hill Carnival is a street party not to be missed. Tempted to find a home in Notting Hill now? We’d love to help you with your move! 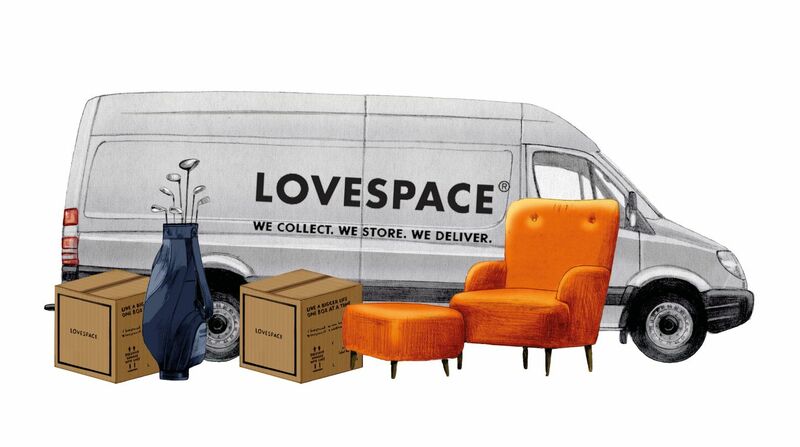 LOVESPACE will collect from your current UK address for free, store your items for as long as you like, and then deliver your items to your new home in Notting Hill – at the click of a button! Click here to get an instant storage quote.